The membership is open to residents living in our area and people who have property in the area and visit from time to time. The Membership Fee provides for the management of the association, public liability insurance, the provision and management of the website and domain name, weekly emails about upcoming events, event planning and hosting, venue charges and bank charges. We are now taking Renewals and New Memberships for 2018 and the new form is available below. SALLE COURS ZEVORT , THE MAIRIE, OFF BOBY LAPOINTE CAR PARK , PEZENAS . Outside events locations and directions will be individually notified in weekly newsletters. 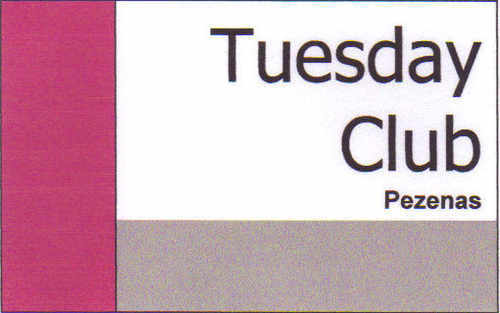 Members Information: The organisers confirm that any personal information provided as part of the application for membership and retained by Tuesday Club will not be used other than for communication directly with individual members about events. Such information will not be used for marketing or be disclosed to third parties. Photographs will be taken at events and displayed on this website and members have been advised and offered the opportunity not to be included when they join and at club meetings.